Patchy Work of Mini Grey: Christmas Day 2012. Merry Christmas dear blog readers. (I know there is at least one! Thank you Ruth for all your lovely comments on my blog throughout the year.) I hope you all had a lovely day yesterday. 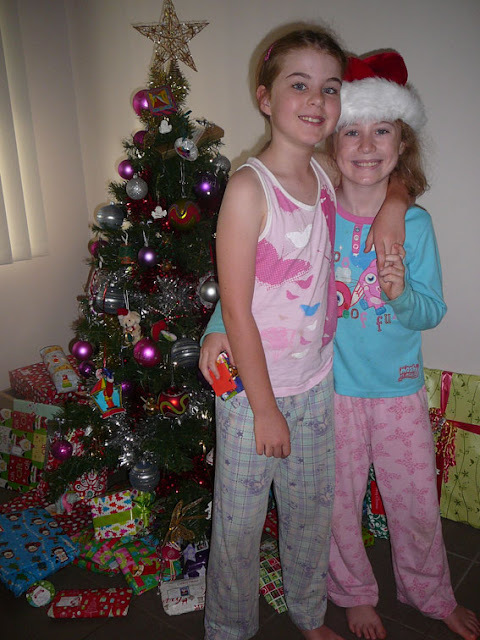 It started very early in this house with the girls up at 5.00 already having tackled their stocking and standing by our bed side at 5.15 asking when they can open whats under the tree. I stretched them out till 6am! 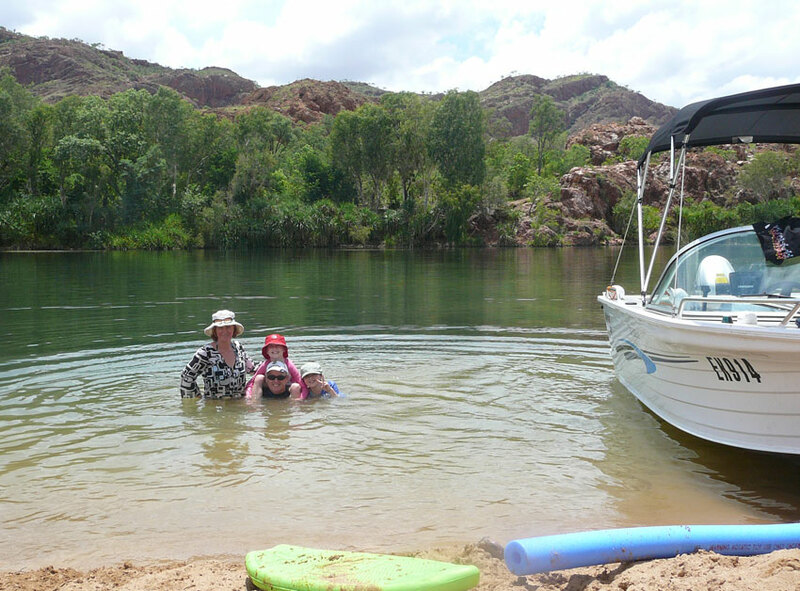 We opened our presents, chatted on the phone to family over the other side of Australia then packed some drinks and snacks and headed out in the boat. We went to our favourite destination, Sandy Beach, a 30 minute boat ride up the river. Its a popular spot but for the whole three hours nobody was there which was fantastic! We put the gazebo up, had a coffee, had some gingerbread and fruit mince pies, went for a swim, watched the grey clouds roll over the range in front of us. It was beautiful, very lucky and thankful to be here for Christmas Day. I did have some quilting related presents under the tree which was wonderful. I had purchased them for myself (except for the fat eighth bundle from my sister Ad, once again spoiling me with beautiful fabric) so it wasn't a total suprise but lovely never the less. 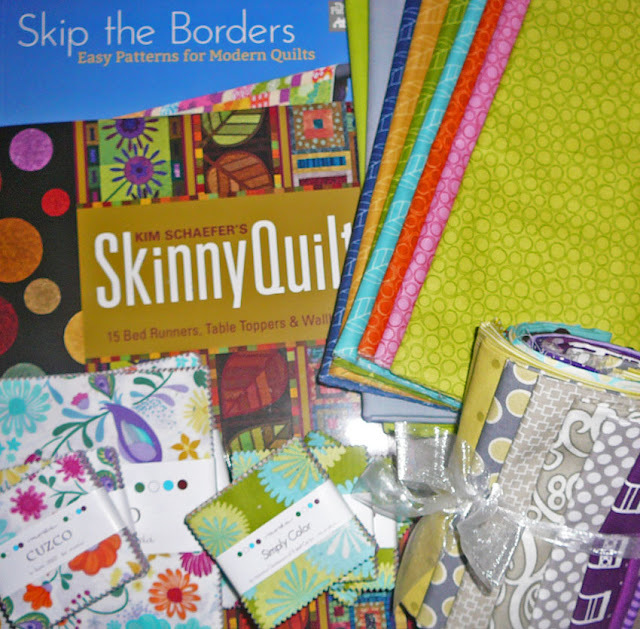 The Skinny Quilt book looks really good, inspiration for more table runners for 2013! The material is from the Fat Quarter Shop, I love the little mini charm packs, super cute! I brought them in multiples of two so I can make whirly gig runners easily. And yardage of plain solids, the dusty blue to go with the Kate Spain fabric and the green to go with the other pack. 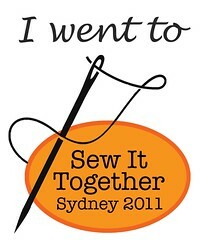 Time for some serious sewing! This is my greatest gift though. The affection these two girls show towards each other is heartwarming. 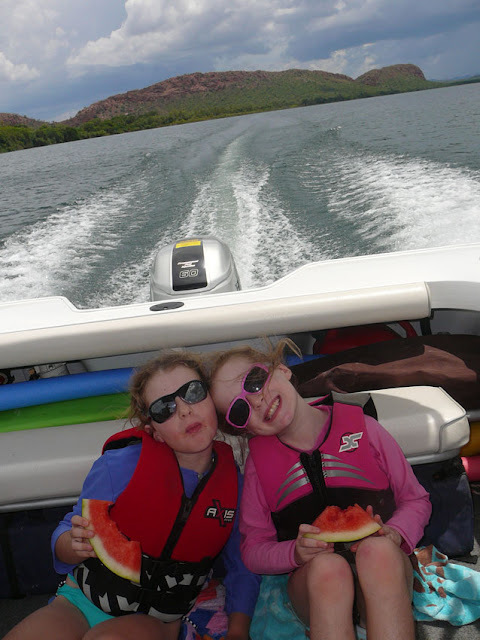 For all the yelling at them and nagging I do throughout the year, no more or less than any other parent I am sure, and here they are with grins as wide as the watermelon slices they are eating. Life is good. Looks like a wonderful day. Our little one, after waking before 6 every day before Christmas slept in until after 7! Love the fabrics you got too. Amen! What a lovely way to spend the day.